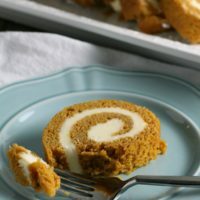 This year, I tackled pumpkin cake roll. Cake rolls always so pretty, but look so intimidating. How do they get the cake to roll like that without falling into a million pieces. You guys have probably been doing it all your lives, but to me it was a new concept. Roll a warm cake into a towel so it cools in a perfect spiral. Definitely not rocket science. 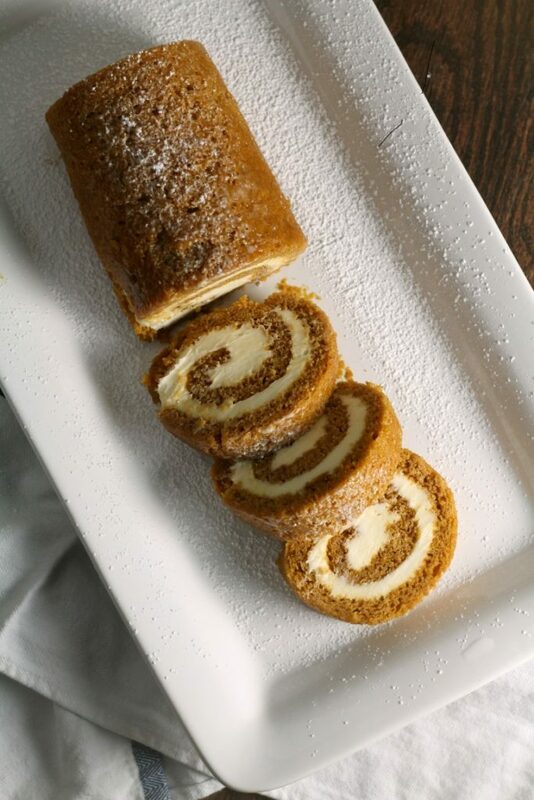 I wasn’t about to reinvent the wheel on this recipe, and settled on try the classic Libby’s Pumpkin Roll. With almost 500, 5 star reviews, I figured it couldn’t go too wrong. It didn’t dissapoint. Some said it had a bit too much cream cheese filling. Personally, I didn’t think so since I’m all about the frosting. But alter it to suit your tastes. I did have a problem with a slight crack (you can see it if you look closely), but nothing that made it ugly or inedible. If you have been as scared of cake rolls as I was, start with this one, it’s easy and super yummy! 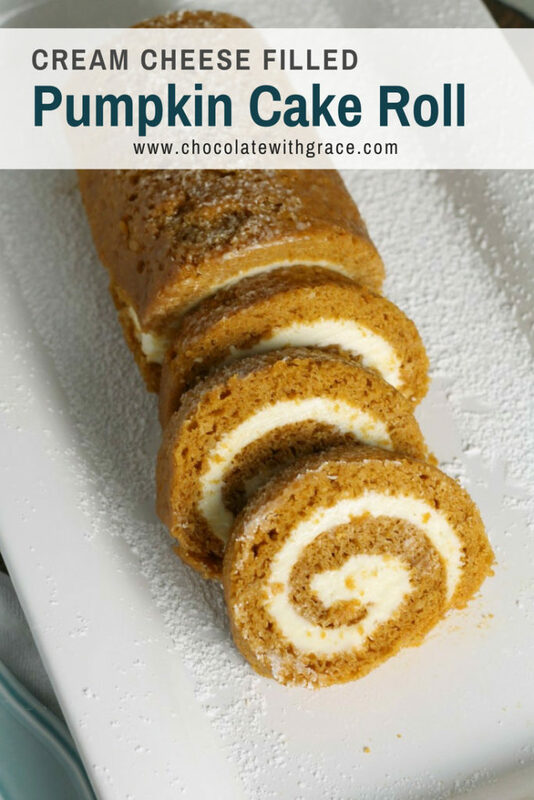 Mouthwatering and elegant, Pumpkin Cake Roll is a classic fall dessert and it actually way easier than you think! Preheat oven to 375 F. Prepare a 15 x 10 in jelly roll pan by greasing and lining it with waxed paper. I lightly greased the wax paper after putting it in the bottom. To make the cake whisk together the flour, baking powder, baking soda, pumpkin pie spice and salt in a medium bowl. Beat together the eggs, sugar and pumpkin, separately in a large bowl. Gently fold in the flour mixture into the wet ingredients. Stir until just combined. Pour the batter into the prepared baking pan. Bake at 375 F for 12-14 minutes or until a toothpick inserted comes out clean. This cake is thin and will bake quickly so keep an eye on it. While baking, prepare a light cotton kitchen dish towel by dusting it generously with powdered sugar. When the cake is done, immediately loosen and flip out onto the cotton dish towel. Peel off the wax paper and roll the cake up in the towel, starting with the narrow end. Let cool completely on wire rack. Meanwhile, prepare the cream cheese filling. Beat the softened cream cheese with the sugar and butter and vanilla, until light and fluffy. When the cake is cool, unroll it from the towel and carefully spread the filling onto the cake. Re-roll the cake tightly. Dust with additional powdered sugar if desired. Chill for at least 2 hours before serving. Slice into 1 inch slices. 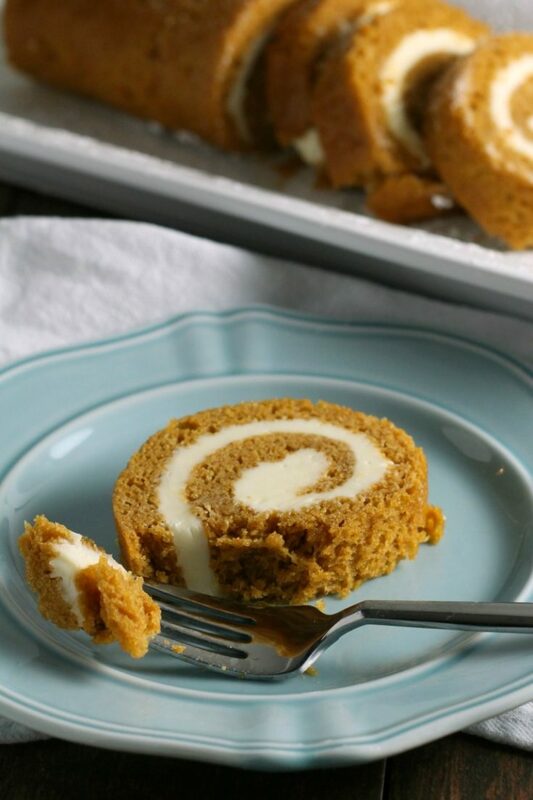 Lightly adapted from the classic Libby’s Pumpkin Roll Recipe.